A: ServiceTitan is the number one field management software for contractors in the home services industry. 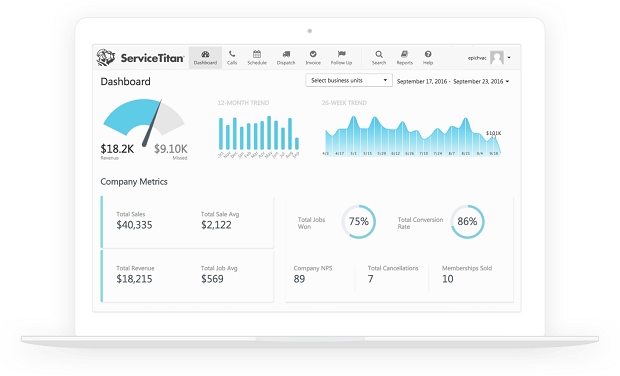 That means for businesses that manage fleets and make service calls for homeowners, ServiceTitan is a comprehensive, cloud-based platform that helps professionals run—and improve— nearly every facet of their business. So, if you run a plumbing company let’s say, you have plumbers in the field running calls, you have customer service reps booking incoming jobs, you have dispatchers managing your fleet, and you may even have bookkeepers doing payroll or marketing personnel. ServiceTitan unifies all the tasks and functionalities of these positions under one system where everything is integrated, everything is synced, and your entire organization is on the same page. This includes managers and business owners, who are given access to valuable business data and insights via our ServiceTitan Dashboard in real time—as their business is operating. One of the key, central things we set out to achieve with ServiceTitan is to bring innovations that we have seen disrupt other industries over the last decade to markets and professionals that have been overlooked by Silicon Valley. The way we shop, the way we watch films and television, the way we use transportation, all of these things have rapidly changed, but a very large segment of home service professionals—who are integral to our communities—are still doing business on pen and paper. That’s what Ara and Vahe discovered on the outset of developing ServiceTitan—that these tradespeople were essentially underserved. And that has been the mission at our company, to champion the underserved. We believe that by continually improving our product, by supporting our customers and keeping their capabilities modern and responsive, we do that. 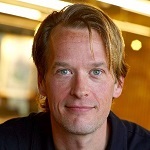 Q: You’ve recently announced $62m in Series C round; could you tell us something more? A: We were proud to announce that ServiceTitan secured $62 million in Series C funding in a round led by Battery Ventures. Our prior investors Bessemer Venture Partners and ICONIQ Capital were also part of this round, which we believe speaks to the confidence they have in our product and our vision for ServiceTitan going forward. 2017 brought a lot of meaningful milestones for our company. We doubled the size of our customer base and, in response, grew our customer success infrastructure into the largest of its kind in the home services industry. The commitment from Battery Ventures and partnering investors allows us to further that success and stay responsive to the evolving needs of our customers. Q: What are the key features of ServiceTitan? A: When we introduce ServiceTitan to a new business, we first focus on three core benefits of the platform: increased revenue, improved efficiency, and better customer service. When it comes to sales, we talk a lot about ServiceTitan Mobile, which is the tablet app technicians go out into the field with. This keeps all their activity tethered to the home office, but more important are the homeowner-facing features: customized, visual price books of services and products, an intuitive three-tier estimate builder, easy signature and payment capture—tools we’ve built that really emulate the online shopping experience. Because of these (and other features), our customers see 25 percent increase in revenue on average during their first year with us. As far as efficiency, nearly all the features of ServiceTitan are designed to expedite tasks and limit pain points— but we’ll often talk about our Dispatch Board, which makes high-level dispatch decisions as simple as a drag-and-drop. We’ll try to highlight ServiceTitan Payments too, which is an add-on package more and more of our customers are using and reporting that it’s saving them hours of work every week batching payments, making deposits, and squaring away their payroll. And for customer service, we’ll usually spotlight our Phone Integration, which provides CSRs rich, detailed customer profiles on every call that not only help book jobs but also finesse the little the little things too, like greeting each caller by name. We’ve really focused on enabling ServiceTitan users to provide a personalized, “white glove” service experience that can catch homeowners off guard and really help build brand loyalty. A: Right now, we serve four specific verticals in the home services industry: plumbing, HVAC, electrical, and garage door repair. We’ve worked with incredible, dedicated professionals across all of these sectors and listened closely to feedback to tailor our platform to the companies we serve. That said, ServiceTitan was always intended to serve various contractors and businesses that offer field service—which includes everything from roofing and painting to pest control. It’s too early to announce anything specific yet, but we can say that tapping into new markets is one of our priorities in 2018 and we’re really excited about it. A: In a lot of ways, we’re spending 2018 doing what we’ve always done—but the scale is getting much bigger. First and foremost, we want to be there for our customers, which means that we’ve had to grow. We’ve already spent much of this year building on our extraordinary team of people. We’re so proud of how far we’ve come as a company and it’s thrilling to see our team expand and include so many individuals who believe in what we’re doing and are committed to our customers’ success. And of course, we’re taking immediate and long-term steps to improve and update ServiceTitan. Part of this means staying vigilant of our current customers’ feedback and the other part means engaging with industry partners, consulting with experts, widening our talent pool, and anticipating what the professionals we serve will need. In 2017, we launched 362 new features on ServiceTitan—and we’re not done yet. We know that in our industry you don’t build a superior product once, you need to continue to refine it and stay aware of new challenges and opportunities to make it better. We’re excited about the updates we have in the pipeline and looking forward to working with even more inspired and engaged tradespeople throughout the U.S. and beyond.